Doing the same show eight times a week isn't easy. 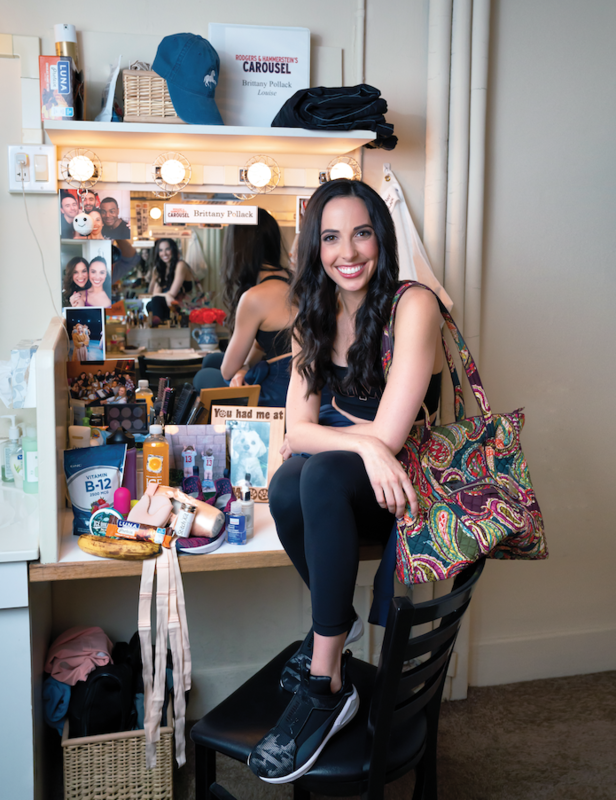 But New York City Ballet soloist Brittany Pollack, currently playing the dance-heavy role of Louise in Carousel on Broadway, keeps her dance bag stocked with ways to get through. She always takes one chewable B-12 vitamin before the show and one during intermission for an added burst of energy. "They taste like Starbursts," she says. She also carries a banana and Luna bar for a pre-performance snack, and applies Love's Baby Soft body spray throughout the show to feel refreshed. "I've worn this since I was a little girl," she says. "My mom still wears it too." Pollack's Carousel dressing room has become a home away from home. While she totes essentials to and from the theater each day in her large patterned bag, her dressing room is filled with mementos and photos of her young nephews, dog Duncan and castmates. Pollack also keeps her script on display. "I remember getting it on the first day and being so excited to see my name in print." On counter, clockwise from top left: GNC Vitamin B-12 Berry Blast Soft Chews, Klean Kanteen, tennis ball ("For rolling out my calves and hips"), Sparkling Ice Orange Mango Water ("It's my favorite! "), PUMA slip-on sneakers ("They're great for walking around the theater between scenes during the show"), Omorovicza lotion ("This brand sponsors NYCB. I love the way it smells! "), hand sani-tizer, Freed custom pointe shoes ("I don't wear pointe shoes for this show, but I try to put them on every day to stay in ballet shape"), Bunheads Stitch Kit, Ouch Pouches, Luna Protein Chocolate Peanut Butter Bar, banana, Ice Breakers Mints, Love's Baby Soft Cologne Mist, Vera Bradley bag ("I've been using these bags for forever. I love that it has a ton of pockets and can be thrown in the wash"). On upper shelf: Uniqlo warm-up pants ("I can't live without these. They're fleece-lined and super-warm").